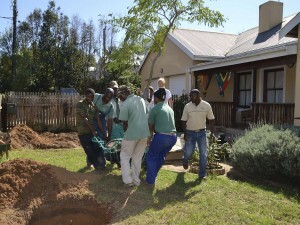 Home > Blog > Barbie's garden > The big Leopard Tree planting! 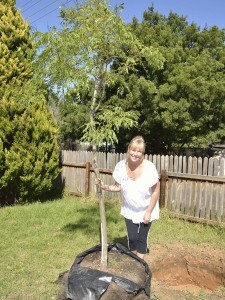 Hi Chris, I know you are dying to see the beautiful trees I bought and that arrived this week! They are Leopard Trees or another name is Brazilian Ironwood (Caesalpinia Ferrea). They prefer full sun and are tender to frost. 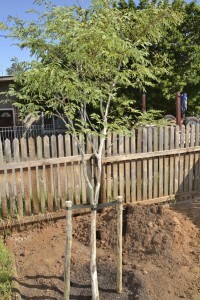 It is deciduous and waterwise (yeay!). One of the most attractive trees, its grey bark peels off to reveal dark brown underneath. Red foliage emerges in Spring which matures to fine, attractive, acacia-like green leaves which provide dappled shade. Bearing clusters of yellow flowers in summer. They are also relatively fast growing. I totally LOVE my new trees! So now you can see the whole sequence of events! Even the arduous digging. 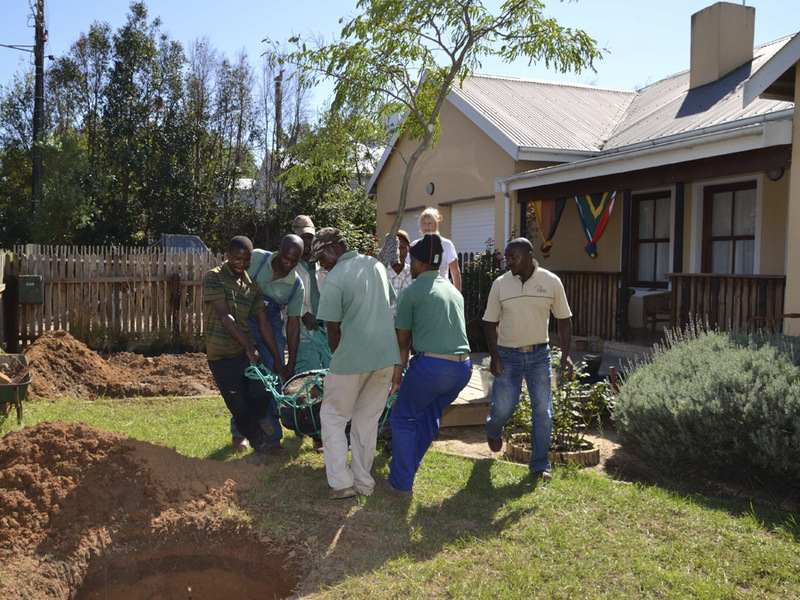 We have such hard clay soil that you need a buzzdozer or a pick axe and muscles like Schwazzenager to get through. It was so tough to do this, and I needed the help of my hubby but even this was not enough. We had to take days to add water to soften the area. 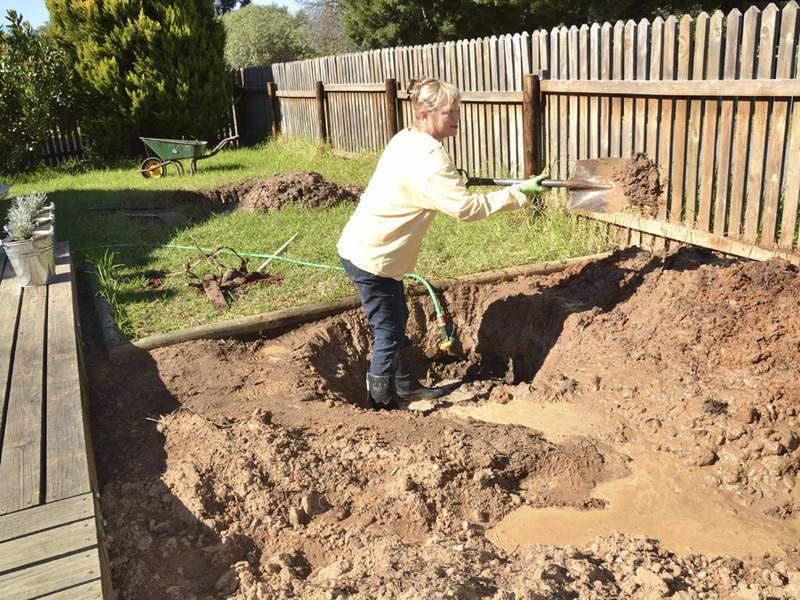 It nearly didn’t happen when my hubby said, “That’s it – just add more water and make it a pond. Bring the koi!! !” But we managed – just, just! You will see – I’m smiling for the camera but I was just exhausted!! I could hardly believe that I had the endurance to keep going. 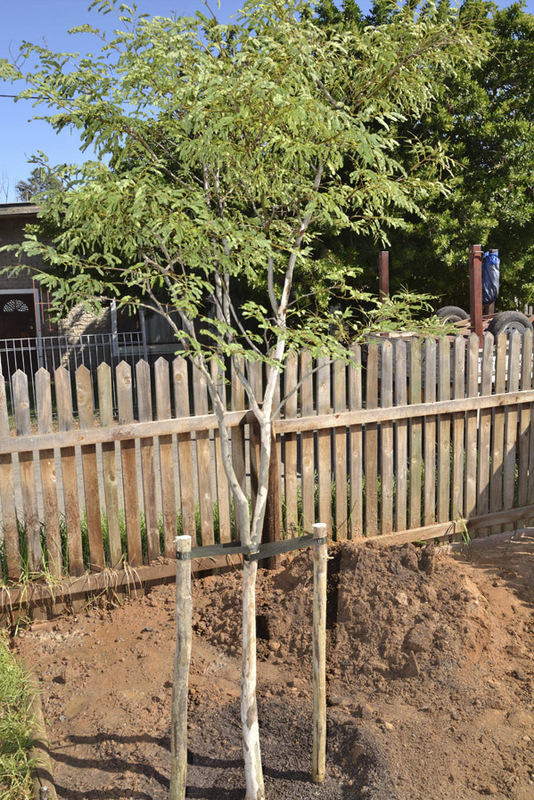 We had to dig a hole 1.1m x 1.1m x .7m for a 250 litre tree which stood 3.5m high! I even surprized myself. I guess it is all the bending in the garden for 6 years! Builds a strong back! Hard work this hole digging! 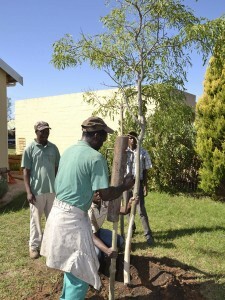 Using a Koevoet to break the ground! Trees SA arrive as promised! 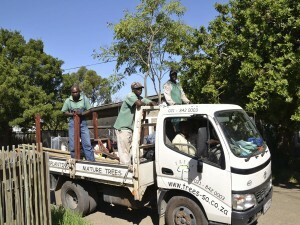 I wish to say thank you to Trees SA for the great experience. 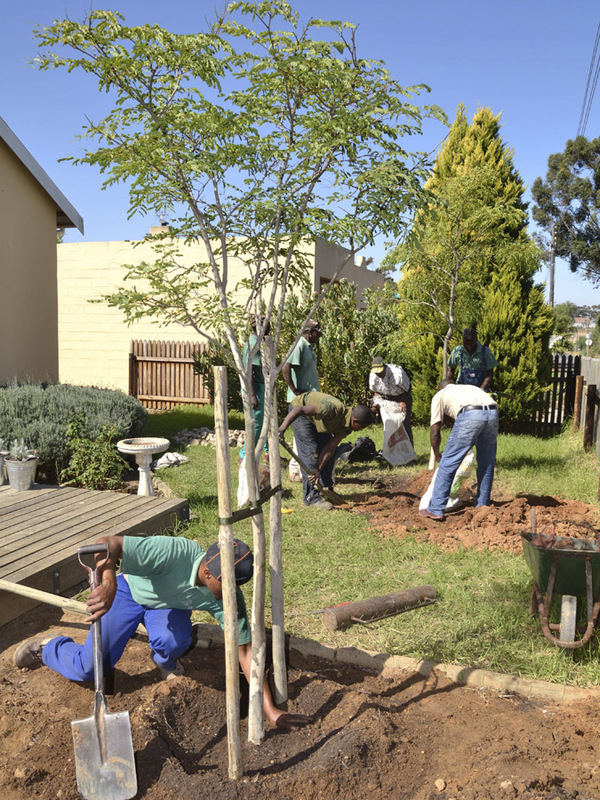 The staff were on time, professional, speedy and efficient – as well as friendly. I highly recommend Trees SA! I’m going to post a special review for Trees SA so stay posted! So Chris, so when are you coming to visit so we can have a “dop onder die bome”!! Thanks for sending me your efforts in lessing the world’s carbon impacts…a good example to follow. Although I have not planted many trees in my rented garden (10 years of drought) – the existing fruit trees attract lots of bird life and adds to my jam pantry too. Will send you some photos on via email of the wild and free roaming Rainbow parrots in my plum trees in my home in Melbourne. I had to laugh a bit at your digging in the clay by adding water. We do that, too. It IS tough work! I hope your trees love their new home. Oh yea! This made it so sticky and heavy and often I fell over because my boots were glued to the ground. There were times when I fell over laughing! But it was the only way. My hubby was going to hire an orger (spelling?) to drill the dirt out! 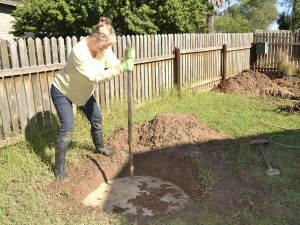 Hi Barbie, You are so so amazing to tackle that digging yourself! No way I could have done that. Well done and look at those trees – these are going to bring you pleasure for the rest of your days in the house!! Wow it was tough digging and I know that this won’t be the last hole I’ll ever dig. I am surprised that my body can take it. You really have a sort of endurance when you garden. I was moving tons of dirt again today. As much hard work as it is/was, it’s so satisfying to be able to plant your own trees! Totally! I love my trees! We are suckers for punishment though! What is the stake or not to stake debate? ?